Later we make a trip down to Bukit Batok Nature Reserve, just to get a feel of the place. Many people often feel that Bukit Batok Nature Reserve is especially quiet there at night. 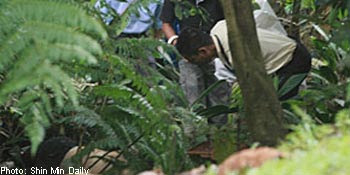 The place is also infamous for some shocking crimes of which remains unsolved today. What lurks within the park? We'll find out. Under the website 'globalsoundis.livejournal.com', one entry contributed by Mr Chye Y Y, gave some glimpse of the cemetry that used to occupy the vast land at Old Holland Road. 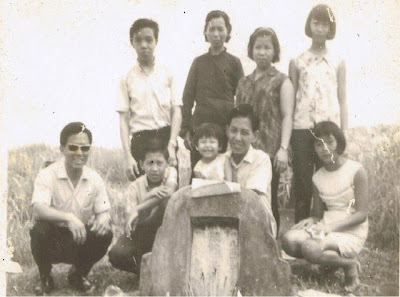 In this picture contributed by Mr Chye, it shows him and his family paying homage to their relatives tomb at the cemetry in 1965. Mr Chye used to live in a village next to the cemetry. The website mentioned that the cemetry was a Hakka cemetry that was part of the Ying Fo Fui Kuan. 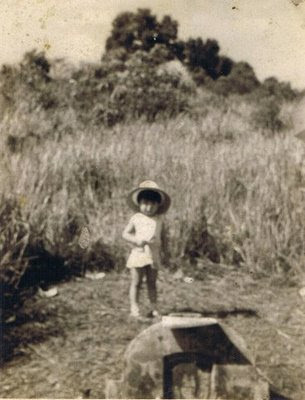 Soon after, the government took control of the land and relocated the tombs to the Ying Fo Fui Kuan cemetry near Bouna Vista. The cemetry at Bouna Vista was a far cry from the vast land of the original Old Holland Hakka cemetry. What remains a mystery is that the government never did anything to the land after taking over control, and till today it remains a vast piece of empty land. Picture of the Ying Fo Kuan Cemetry at Commonwealth Ave, near Holland Village. Rumours had it that Mr Lee Kuan Yew's grandfather used to be buried in the cemetry at Old Holland Road and was relocated to this cemetry when the land was reoccupied by the government. Our investigation started right around midnight at Old Holland Road. The place was quiet. Flanked by loads of private houses, this place gives a serene and peaceful feel. Moving along the empty patch of grasslands, we realized that there were plenty of humps and heaps of grass over various patches of land, as if they were remnants of the tombstones that used to be all over this place. Perhaps they were. Some orbs appeared around these places. Spirits of the past from the tombs of yesteryear out to greet us? Dandelion flowers littered the entire place. Dandelion flowers are often associated with sympathy, affection returned and faithfulness. They are common in cemeteries and once again point to a certainty of the purpose of this place. Some parts of the grasslands had weird shapes as well as flowers and shrubs that seem out of place. The various different kinds of flowers left behind the various tombstones could have laid its seeds here and eventually led to the growing of the plants all over the place. At times, strange orbs seem to come, literally come out, to greet us from the patch of darkness... Whoever could have thought of 4 strange people coming at this time of the night to explore this place? It was a pretty solid brick structure that was embedded into the ground, just metres away from the main road. Its top part was gone, but the growing of grass in the middle of the structure suggests that there was a hole in the middle of this structure. Sure enough we did uncover a part of hard land, and that of soft land. This could indeed be the entrance and the gate of the cemetery! As we were testing out, what seems like an orb appeared near the gate structure...old caretaker of the cemetery coming out to greet us or see what we are doing? Nearby to where this structure is, Agent MaXx spotted a small stream of water. It was muddy and clogged. However, Agent MaXx who is well informed, told us that for most cemetery, the outside and inside of it is usually separated by a small stream of river/water. And this is consistent to what we saw. After all the evidence that we had found along the way, we can quite positively mark that there is a high possibility that this place is indeed a cemetery in the past. However, haunting-wise, it has nothing to show for. This reserve holds some criminal history too, being the site where tales of unsolved rapes still linger through the minds of residents here...According to reports, a lady was raped and murdered at this part on 6th Feb 2001, while she was jogging in the reserve in the morning. The case was never solved, and the murderers of this hideous crime are yet to be apprehended. Certain parts of the reserve, I felt like there were entities around, either looking at us and ocassionally behind us, and when I had those instincts, I turned behind for a shot. Sure enough, there were orbs. We walked our way back, tired and certainly thirsty....Saw a little kiddy bicycle along the way out...It was not locked or chained, just left there. Fishy? HAhaha i think some of those humps were caused by me and some other random people. I used to cycle arond that area, and towards the southern edge of the field(way accross the field opposite MGS) there were mounts of dirt with wooden planks on them. BIKE RAMPS!!!! i thought. so for a while after that, i helped this mysterous person to build up his dirt mount bike ramps. however, i stopped when my dad told me that the place seemed a little "dirty" and there were many stones in the area which looked off, some of them with inscriptions. i finally totally stopped building when one day, i was digging for soil to put on the ramp, when i hit something hard. a large rock with many chinese words on them. oh i see! haha how long ago did you cycle over there? yes the place was a cemetery before. But it has since been cleared. thanks for the really interesting sharing of your experiences!